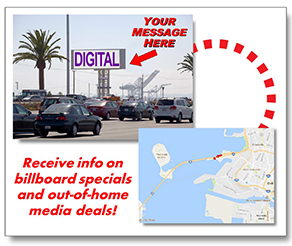 Billboard Connection specializes in locating the best available out-of-home advertising opportunities in the Bay Area and beyond. Whether it’s high-profile areas such as the downtown SF Skyway, South of Market, SFO, the Peninsula, Silicon Valley, Bay Bridge or along major freeways such as U.S. 101, I-80, I-880 we can assist you, throughout the state or country, in getting your message to millions. For Quote and/or FREE consultation, please fill out the form below. What type of advertising are you doing now? What City/Cities are you looking to advertise in? Notes/Additional Info - Please provide all applicable details; the more info provided, the better we can assist you.